The Australian Trellis Door Company (ATDC) ‘s latest addition to its suite of quality commercial and industrial doors includes its new high impact resistant traffic door TD001 which has been launched initially for the Sydney,Melbourne,Brisbane and Canberra markets.The launch of these new doors confirms ATDC’s intent to diversify further into the Australian industrial door market. Traffic doors provide a barrier between two areas. They are designed to be opened by impact. They can close automatically from either direction. They open from either direction as they are impacted by trolleys, pallet jacks, forklifts and they can be made as either single or double doors. Traffic doors speed up the movement of people and stock between parts of a building as they avoid the need to stop, open, move through and manually close like traditional door types. After passing through, the door automatically swings closed. 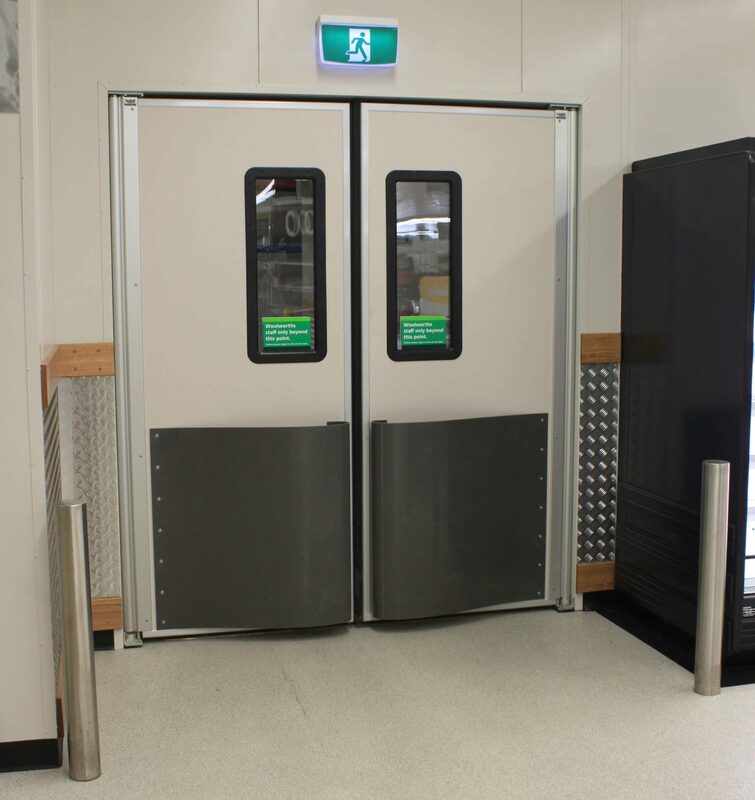 These double action 180 degree swing doors are ideal for industrial and commercial applications that are exposed to high traffic flows including coldrooms,supermarkets,retails stores,commercial kitchens,Pharma labs,hospitals,surgeries,workshops and warehouses.The traffic doors are heavy duty and with their high density PU foam core and optional double glazed polycarbonate window (with its fully moulded gasket seal),these doors are an effective temperature control tool and are an ideal means to keep out dust,insects and other airborne nuisances.Optional features include either kick plates or teardrop bumpers which are available in a black,grey or yellow finish.The kick plates are available in stainless steel or polyethalene.And the doors are virtually maintenance free. The traffic doors are customized to suit each application with maximum sizes at 3000mm wide x 3000mm high.They have an anodised aluminium door stile with the option of powdercoating the frames.For further technical information see ATDC’s website at https://www.trellisdoors.com.au/product/commercial-industrial-doors/high-impact-traffic-doors/traffic-doors . View ATDC’s website at https://www.trellisdoors.com.au/products/commercial-industrial-doors/high-impact-traffic-doors for further information or contact ATDC toll free on 1800657435 from anywhere in Australia for a free measure and quote.